The United States Congress designated the North Algodones Dunes Wilderness (map) in 1994 and it now has a total of 25,895 acres. All of this wilderness is located in California and is managed by the Bureau of Land Management. Approximately eight miles wide and 40 miles long, the Algodones Sand Dunes system is one of the largest dune complexes in North America. Still, only a relatively small section north of State Highway 78 has been designated Wilderness, while the rest hosts an abundance of outdoor recreational vehicle traffic. The Wilderness lies divided into two distinct zones: the primary dunes on the west side and the secondary dunes on the east. The former are taller and larger, and composed of noticeably coarse sand. The latter are smaller, made up of finer sands that are periodically shifted even farther east by prevailing winds. The secondary dunes are interrupted in places by basins or flats, where you'll find mesquite, smoke tree, ironwood, paloverde, and desert willows. Streams draining from the nearby Chocolate Mountains to the north flow to the edge of the dunes in spring, and form pools where the sand acts like a dam. The area supports the flat-tailed horned lizard, desert tortoises, and the Colorado fringe-toed lizard. In the fine sands of the secondary dunes, you may see the Andrews dune scarab beetle. As you cross the trailless expanse of the dunes, of course carrying plenty of water, you can be assured of an unforgettable desert experience. 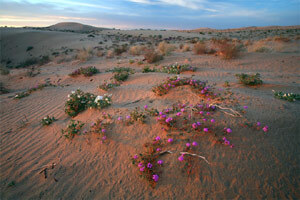 Planning to Visit the North Algodones Dunes Wilderness? How to follow the seven standard Leave No Trace principles differs in different parts of the country (desert vs. Rocky Mountains). Click on any of the principles listed below to learn more about how they apply in the North Algodones Dunes Wilderness.